Chris Pitsiokos is representative of a new generation of musicians currently working in the experimental New York jazz scene. Following in the footsteps of John Zorn, he has been gradually expanding the expressive possibilities of the alto saxophone, under the influence of Ornette Coleman’s harmolodics, No Wave’s confrontational aesthetic, and Stockhausen’s timbral explorations. 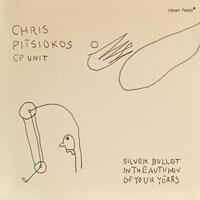 Pitsiokos’ Unit features a rotating cast of characters, including the leader’s regular companion, Tim Dahl on electric bass; alternate bassist Henry Fraser; Connor Baker or Jason Nazary on drums; and Sam Lisabeth on electric guitar. On Silver Bullet In The Autumn Of Your Years, the second record with his flagship Unit, the personnel changes on each cut, yet characteristic of its communal nature, the tonal shifts are seamless, making the most of each member’s visceral contributions. Numbers like “The Tower” and the epic closer “Anthropod” explore broader stylistic territory, gaining momentum as they ascend from aleatoric impressionism to full-blown expressionism – evoking not only the hushed subtlety of lower case improv, but the dissonant angularity of early No Wave artists like The Contortions, The Golden Palominos, and Material. Pitsiokos and crew play with wild abandon throughout, transcending imitation with pluck and determination. Using Zorn’s saxophone language as a foundation, Pitsiokos employs all manner of extended techniques and embouchure torture to craft his own dialect, although he has yet to find a truly distinctive voice. Pitsokos is an artist on the rise; expect great things from him in the future. 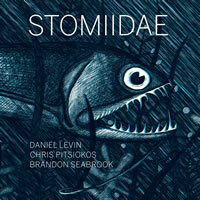 Stomiidae is named after a family of predatory deep-sea fish, with track titles derived from its different breeds, such as “Eustomias Trewavasae” and “Neonesthes Capensis.” For this collaborative effort, Pitsiokos is joined by cellist Daniel Levin and guitarist Brandon Seabrook in a freewheeling trio session of spontaneous collective improvisations that attempt to emulate the primal existence of these subterranean creatures. To portray these exotic life-forms, the group avoids standard tonalities, using extended techniques to create a wide range of dissonant textures and mottled hues. Episodes of torrid freedom are balanced by sections of eerie calm, rising in frenzy before drifting down to still silence. Unfettered exchanges yield spacey pointillist interludes pregnant with anticipation that quickly shift to reveal cacophonous bursts of activity. Eschewing the conventional, Pitsiokos unleashes frantic runs, circular motifs, and bristling interjections with altissimo squeals, multiphonic blasts, and growling vocalizations. Seabrook responds in kind, with short, sharp bursts of distortion and a dizzying array of fingerpicking. Levin similarly engages in aberrant bowing and plucking, eliciting piercing harmonics and percussive pizzicato. Though somewhat repetitive, there are enough captivating moments on Stomiidae to immerse enthusiasts of creative new music in the experimental waters that the trio navigates. 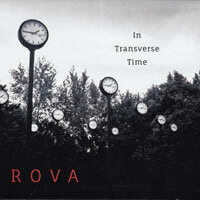 Over the four decades since they were founded, the indefatigable Bay Area wonders ROVA remain as restless as they are resourceful, producing music for an impressively wide range of settings both physical and instrumental. And whether or not you’ve seen live how purely communicative a group they are, you’ll hear in the elegant flow of the pieces on this latest disc how vital and energetic a musical voice they remain. If one thing unifies the pieces on In Transverse Time, it’s an accentuated concern for aural space. The group’s general attention to balancing structure and spontaneity helps realize the subtle, elegant “Oxygen,” crisply captured at the Mills College Art Museum. Held tones contrast with deceptively simple scalar lines and little squalls of noise, or improvised asides. Throughout, there’s considerable attention to varied techniques, voicings, and tones, from tart pointillism to what could almost pass for a choir of flutes or metallophones. The piece sounds as if it’s continually turning itself inside, or inhaling and exhaling if you like, moving from elegy to fanfare, rhythm to space. Steve Adams’ 6-part “The Dark Forest Suite” was inspired by Georgian choral music (an interest he locates all the way back to ROVA’s 1989 tour there). I typically enjoy ROVA pieces that have a lot of coloristic range and conceptual ambition, whether it’s “Paint Another Take of the Shootpop” or one of the long pieces from The Works volumes. Between this suite’s elegant, lyrical introduction and its dark, reflective coda are four folkish songs filled with pungent harmony. Tightly focused, each spotlights a different element of the group sound, from a bluesy Jon Raskin baritone solo to miniature dance routines. “A Leap of Faith in Transverse Time” (the first of two Raskin pieces) is made of beautifully open-ended stuff, lyrically and conceptually almost like an extended version of the suite opener. It’s bittersweet in places, filled with space and the sense not to try simply filling it. “The Time Being” is one of their knotty, rhythmic pieces, elegant and full. The horns, perhaps especially the altos, shout joyfully here. And it’s hard not to feel that same spirit when ROVA gets into its swinging momentum. The lengthy “Hidden in Ochre” is a study in fullness and reserve alike, written for a resonant gallery and really just a showcase for ROVA’s extraordinary facility for dynamics. Across its 25 minutes, ROVA takes in a lot of different territories. There are honking unisons, low-end riffs, skirling upper end tangles, and contrapuntal madness. But what really grabs you most are the open spaces for silence, soft chirrups, lush dynamism, and some sterling solos (Raskin and Ochs sound intense). It’s compelling and resonant on record, and must have been mind-blowing live at the gallery. Yet another top-notch album from an ensemble that goes from strength to strength. James Tenney’s work is next to impossible to sum up. He composed pieces ranging from tape collage, computer and tape pieces, player piano, various solo instrumentation, percussion ensemble, chamber groups and orchestra, and vocal ensembles. 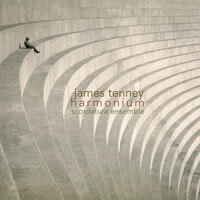 While his compositional practice had many focuses, Tenney once commented that his music is “Sound for the sake of perceptual insight – some kind of perceptual revelation.” New World Records previously released Spectrum Pieces covering the eight compositions Tenney wrote between 1995 and 2001 which hone in on the array of partials contained within single harmonic series. The pieces on this disc, Harmonium, are earlier pieces (composed between 1971 and 1984) which concentrate on similar sonic explorations. Here, the instrumentation varies encompassing trio, thirteen-piece string ensemble, viola and tape delay, septet and multiple tape delay system, and solo viola, with each concentrating on particular areas of the relationships of intervallic patterns. The recording opens with “Harmonium #1,” dedicated to Lou Harrison and realized by a trio of voice, viola, and keyboard. Each performer works from a set of pitches, slowly modulating their dynamic. Listening, one hears the way that the fundamentals and overtones of each pitch changes as they combine with each other. One’s aural focus combines these intersections into subtly vacillating complex harmonic relationships. “For 12 Strings (rising)” from 1971, is based on an early electro-acoustic piece of Tenney’s titled “For Ann (Rising).” Based on a set of continuously rising tones, it zeros in on the phenomenon created when glissandi from their lowest notes to the top of their audible range are overlapped in parallel across the string ensemble, causing uneasy auditory beatings from relative harmonic stasis. The spartan electro-acoustic sonorities of the original piece are enriched here by utilization of the acoustic overtones of violin, viola, cello, and double bass, forming a disorienting listening experience as one’s attention oscillates between attempts to follow the glissando of an individual instrument and the waves of undulations as the various lines intersect and converge. “Two Koans and a Canon,” for viola, on the surface, is a more straightforward affair. Here, the interactions of closely pitched notes build subtle beating pulsations as pitches are minutely shifted. In “First Koan (a gentler Beast)” those interactions are isolated to a drone pitch and a coinciding pitch which is shifted in and out of sync. “Second Koan” is a study in wavering cross-string tremolo, with each string moving in and out of phase with the other with hypnotic effect. The brief “Canon” utilizes a tape delay system to provide shadow echoes as the player ascends the low C string of the instrument, introducing new pitches against the specter of hanging delay. Taken together, the three movements accrue to create multifaceted insights into the elemental sonic properties of a bowed string. At just over 24 minutes, “Voice(S),” for variable ensemble, vocal, and a multiple tape delay system is the longest, and most complexly scored of the set. Like “Harmonium #1,” the performers chose from gradually varying pitch sets. But here, there is more freedom in how the musicians choose them and move between them. Additionally, two tape machines are used to capture decaying echoes which are mixed in to the ensemble. A third is added to record the first third of the performance which is then replayed in reverse and at half-speed, adding quavering inverse refractions at an octave lower into the mix. Finally, a fourth tape machine records the first two thirds of the performance and is played back at double speed, adding yet another layer at an octave higher to the mix. While the technicalities of this seem thorny, the results are beguiling, with layers upon layers of harmonic interaction organically reconfiguring like cumulus clouds in a sunlit sky. The instrumentation of soprano voice, viola, keyboard, recorder, clarinet, trombone, and cello provide a timbrally rich reading of the piece as it moves from hushed transparency, through increasingly ethereal layers, finally resolving into harmonic clarity. The set ends with the compact “Blues for Annie,” a transcription for solo viola of “No More Good Water ‘Cause the Pond is Dry” by the early 20th century country blues musician, Jaybird Coleman. Tenney transforms the gritty cry of Coleman’s vocals and harmonica choruses into a keening meditation on the coursing flow of the original. The performance by violaist Elisabeth Smart has a directness capturing the original’s exclamatory passion. Kudos to New World Records for continuing to document the work of James Tenney with focus and dedication. 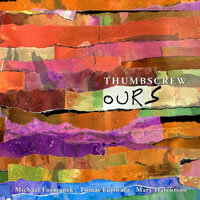 It’s been four years since Thumbscrew, the all-star trio of guitarist Mary Halvorson, bassist Michael Formanek and drummer Tomas Fujiwara, released their self-titled debut on Cuneiform Records. A second album for the label, 2016’s Convallaria, was produced during a residency at Pittsburgh’s City of Asylum, as was Ours and Theirs – the first new recordings offered by a revamped Cuneiform Records. Demonstrating the inherent chemistry of musicians who have long been collaborating together, Ours consists of original compositions, while Theirs – in contrast – comprises covers from an eclectic assortment of artists, ranging from Benny Golson to Misha Mengelberg. 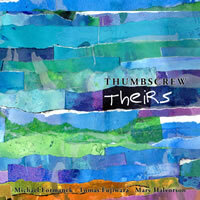 Thumbscrew is a true cooperative effort; all three members contribute equally, both in composition and improvisation. Formanek, Fujiwara and Halvorson have performed in numerous projects together, including Formanek’s Ensemble Kolossus, Fujiwara’s quintet The Hook Up, and most recently, in Halvorson’s Code Girl. Over the past decade, Halvorson has risen from a promising new voice in creative improvised music to the foremost guitarist of her generation. Her inimitable technique is readily identifiable, and her approach towards composition similarly defies convention. Formanek’s associations with such singular veterans as Tim Berne and Uri Caine, along with his own impressive body of work, make him a perfect fit for Halvorson’s idiosyncratic aesthetic. Rounding out the trio, Fujiwara not only has a longstanding association with Halvorson, but enjoys a keen rapport with Formanek. Ours features three diverse works apiece by Formanek, Fujiwara, and Halvorson. The guitarist’s Iberian-tinged “Snarling Joys,” opens the date with flamenco-like urgency, revealing Formanek’s probing bass solo as the song’s meditative center. Similarly, the percussive invocations that introduce Fujiwara’s “Saturn Way” trade triadic interplay for aleatoric abstraction, while Formanek’s “Cruel Heartless Bastards” ushers the ensemble through labyrinthine tempo changes, as Halvorson takes the punkish cut to the stratosphere with a dizzying, effects-laden solo. Conversely, Halvorson’s “Smoketree” advances slowly, suffused with lamenting chords before finally ascending to a spiky climax. The bassist’s “Words That Rhyme With Spangle” is another angular number fraught with nervy asides and sudden shifts, but he’s also the author of “Unconditional,” which finishes the protean set on a serene note. Theirs is a collection that never fails to surprise, because Thumbscrew largely adhere to a more traditional approach on these classic tunes, working within standardized forms. They bring their unique arrangements and ensemble interplay to a varied mix of covers, ranging from Great American Songbook Standards to jazz staples by such legends as Stanley Cowell and Wayne Shorter, as well as songs from South American composers Julio De Caro (Argentina) and Jacob Do Bandolim (Brazil). The opener, a fairly straight-ahead rendition of Benny Golson’s “Stablemates,” swings effortlessly, even as the warped tonalities of Halvorson’s heavily processed guitar alters the song’s mood. Herbie Nichols’s “House Party Starting” is representative of the under-sung composer’s quirky flair, while dreamy ballads like Jimmy Rowles’ “The Peacocks” and Evelyn Danzig’s “Scarlet Ribbons (For Her Hair)” highlight the trio’s lyrical restraint. Strong Latin influences underpin De Caro and Do Bandolim’s tunes; the latter spotlights Halvorson’s melodious, yet elaborate fretwork. Regarding the contrast between the two records, Halvorson says, “The difference is that with the covers we’re aware of trying to honor the composer’s vision, and in many cases, classic versions of the song which serve as inspirations.” Revealing very different sides of this group, the combination of Ours and Theirs is the best work to date by this all-star trio and among the strongest current releases in the Cuneiform Records catalog.